The Winslows are hitting the road after the Fool's Ball and heading north to St. Louis. 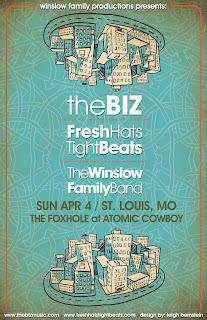 Come check out all of the current Winslow Family Bands on Sunday, April 4th at the Fox Hole inside Atomic Cowboy. New Album Getting Great Reviews! THE ANCIENT FUTURE IS HERE!